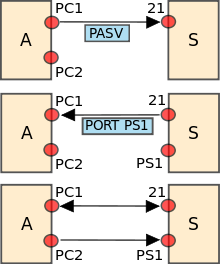 The File Transfer Protocol(FTP) is the standard network protocol used for the transfer of computer files between a client and server on a computer network. FTP protocol is available in any premium hosting or linux hosting or VPS hosting. FTP is built on a client-server model architecture and uses separate control and data connections between the client and the server.FTP users may authenticate themselves with a clear-text sign-in protocol, normally in the form of a username and password, but can connect anonymously if the server is configured to allow it. For secure transmission that protects the username and password, and encrypts the content, FTP is often secured with SSL/TLS (FTPS). SSH File Transfer Protocol (SFTP) is sometimes also used instead; it is technologically different. FTP may run in active or passive mode, which determines how the data connection is established.In both cases, the client creates a TCP control connection from a random, usually an unprivileged, port N to the FTP server's command port 21. FTP login uses normal username and password scheme for granting access.The username is sent to the server using the USER command, and the password is sent using the PASS command.This sequence is unencrypted "on the wire", so may be vulnerable to a network.If the information provided by the client is accepted by the server, the server will send a greeting to the client and the session will commence. If the server supports it, users may log in without providing login credentials, but the same server may authorize only limited access for such sessions. FTP has a stateful control connection which maintains a current working directory and other flags, and each transfer requires a secondary connection through which the data are transferred. In "passive" mode this secondary connection is from client to server, whereas in the default "active" mode this connection is from server to client. This apparent role reversal when in active mode, and random port numbers for all transfers, is why firewalls and NAT gateways have such a hard time with FTP. HTTP is stateless and multiplexes control and data over a single connection from client to server on well-known port numbers, which trivially passes through NAT gateways and is simple for firewalls to manage.”. 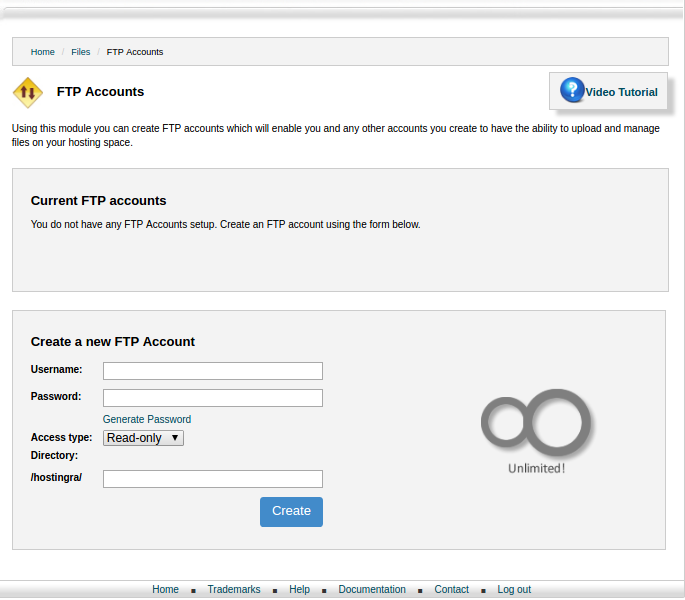 The interface itself shows the clear steps of how a ftp account can be created. Let's looks at them one by one. The first space ask for the username what you want to set for the ftp account.This can be alphanumerical. Next one is password for the ftp account.The stronger passwords is always recommended. The page consist of password generator which helps with number of password suggestions to choose with. This is to choose the access between read access,write access or full access of the directory. This helps to choose the directory from where you want to allow the access to the particular ftp account. The same credentials can be used to access the ftp.For example shown with filezilla in this case. You have the option to reset the password in the same module in order to extend the security level. Select the home directory provided.